This is one of the funny kids bedtime stories for kids to read. There once was a sage who had many students who lived with him. 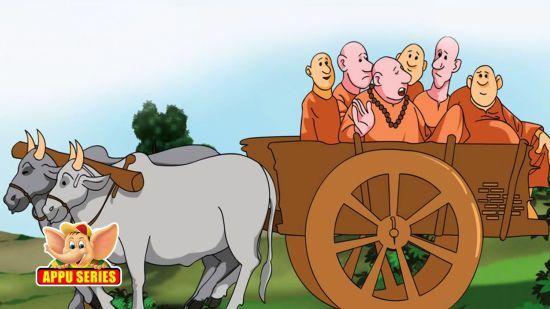 One day, the sage took them all for an outing in a bullock cart. The sage being old was tired. He said, “Students, I am feeling very tired and would like to take rest. Be very careful and keep a watch so that our things may not slip out of the cart.” The students said, “Yes, Sir!” Also, read The Foolish Boy. The sage got very angry and said, “What? The vessel of holy water fell down? Now, how will I carry water?” The students replied, “But Sir, you only asked us to watch the things falling off the cart, not pick them up.” The Sage said, “Oh, fools! What I meant by watch was that you should take care that nothing falls off the cart. Next time onwards, pick up everything that falls out and put it back into the cart. Is that understood?” The students agreed. The bullock cart moved on. The sage dozed. A little while later, the bullocks dropped some dung on the ground. On seeing that, one of the students jumped down, picked up the dung, rolled it up and threw it into the cart. The huge ball of dung landed right on the sage’s face waking him up with a shock. The sage shouted, “What on earth is this?” The students replied, “Sir, why are you cross with us! We only obeyed you by picking up everything that fell on the ground and putting it back into the cart.” “Oh my god! Why can’t you understand simple things?” asked the sage. You may also like to read, Clever Gretel. The Sage was silent and thought for a while. He then came up with a very good idea. He listed out all the things in the cart and gave the list to the students saying, “Look, children, if any of the articles given in the list slips down, you must pick them up.” They moved on and the sage once again fell asleep. The students too were dozing. The bullocks now started climbing up the hill. As they went up, the sleeping sage slid down into the cart and fell into the stream which was running by the side of the road. The sound of the big splash woke the students.The sage was shouting for help. They jumped down the cart. Then they remembered what the sage had said and quickly took out the list and searched for the sage’s name. However, they could not find it. So, they moved on. “Obeyed me? How can you say that? You have not even tried to understand what I have been trying to tell you. Instead, without even thinking you have just been following my words!” Also, read Little Red Hen.